To enter the giveaway, please take the actions below. Take more actions to increase your chance of winning! I´ve been a fan of BAE Audio for several years. – Why? Because they produce some of the best analogue gear out there. Their products model the most sought after vintage hardware to the tee – With BAE you get the vintage sound with modern reliability. BAE´s philosophy is keeping every component of their products as closely matched to the original hardware as possible, to give your access to the sound of hard-to-come-by vintage units. And let me tell you: They are doing a fantastic job! The build quality and sound of their products are the best you´ll find. 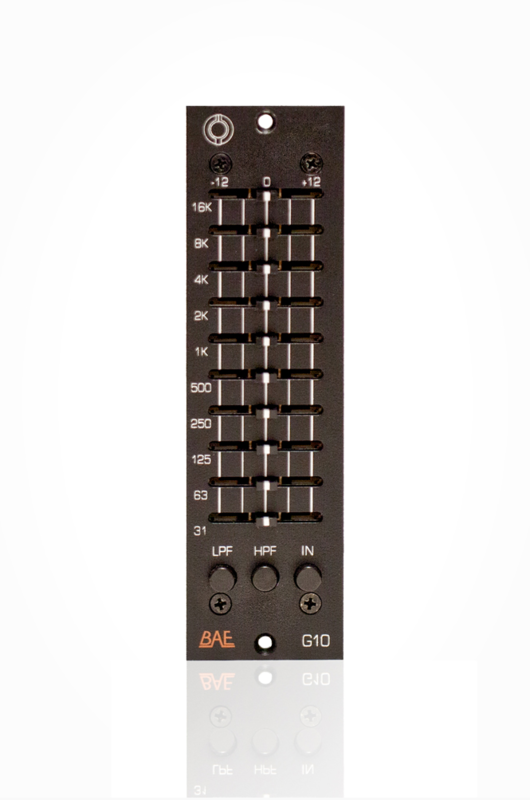 I´ve had G10 EQ to try out for a couple of weeks.- And I love it! It retains fast transients beautifully and lets you sculpt the tone in a very natural and smooth way. This makes it the perfect EQ for mixings drums, whether it be kicks, snares of overheads. The responsiveness and vibey tonal character introduced by it´s transistors makes this EQ one of my favourites for tracking guitars. – Get the best sound at the front-end! I´m sure once you hear it, you´ll fall in love with it as well. So don´t hesitate and sign up for the giveaway now. If you win this thing, we´ll will ship it to you anywhere in the world – no matter where you´re located! Remember: The more of the suggested actions you take, the higher your chance of winning. I hope you enjoy this giveaway and good luck! We currently have another BAE competition running. In this competition, you´ll get the chance to play on the same track with some of the best musicians in the world: Billy Sheehan and Kenny Aronoff. The winner will officially be featured and the song will be released on i-Tunes. You´ll get to win a BAE Hot-Fuzz guitar pedal in the process. To learn more, click this link: Join the BAE Hot-Fuzz-Pedal Competition. The competition ends on October 31st. So Hurry!